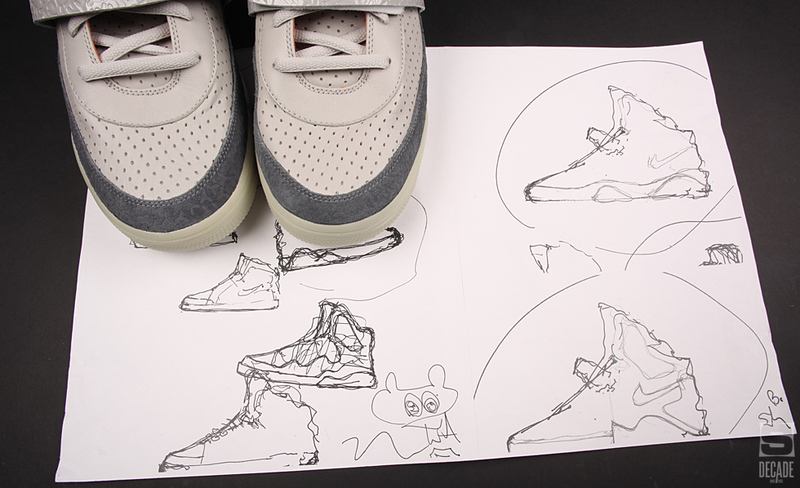 In a classic interview from Issue 29, the two Innovation Kitchen minds behind the Air Yeezy walk us through the shoe's process. All during the summer of 2009, the hype and anticipation leading up to each of the three releases of the first Nike Air Yeezy had been unparalleled in those recessionary times, as not only were entire outfits staged around the tones and accents of the now-classic sneakers, but there’s been a love affair with the retro-driven model that’s sparked some healthy discussion amongst our long-blown-up subculture. Across the country, hesitation was nowhere near the scene of a boutique register, as $215 was counted up or swiped via plastic over, over and over again. Just as many people were left with even a remote chance at a pair when they released. At the time, our Issue 29 cover in August of 2009 actually marked the first time we’d ever included a cover feature detailing a shoe after its release. The explanation was simple, as we had never-before-seen images taken throughout the two-year process of the project, along with insights straight from the shoe’s main designer and developer, Mark Smith and Tiffany Beers from Nike’s Innovation Kitchen. At the time that Mark Smith’s phone rang on a random February day in 2007, he was already knee-deep in an endless array of projects for Nike’s Innovation Kitchen. Whether that included helping to shape and craft the Air Jordan XX3, helping laser up a storm of one-of-one exclusives for friends of the brand as the Creative Director of Special Projects at the time, or helping to redesign the all-new and relocated Kitchen, surely adding another high-profile brief to his workload wasn’t at the top of his wish list. 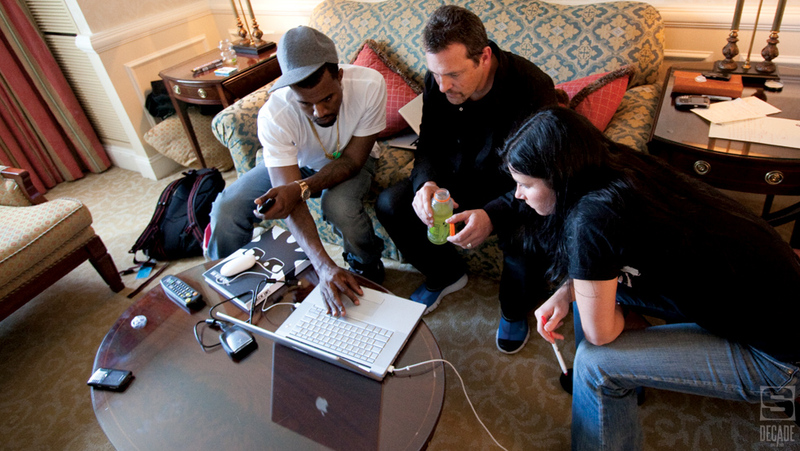 After the initial meeting, Kanye and Mark Smith were able to hammer down a concept of exactly where the project could be headed. 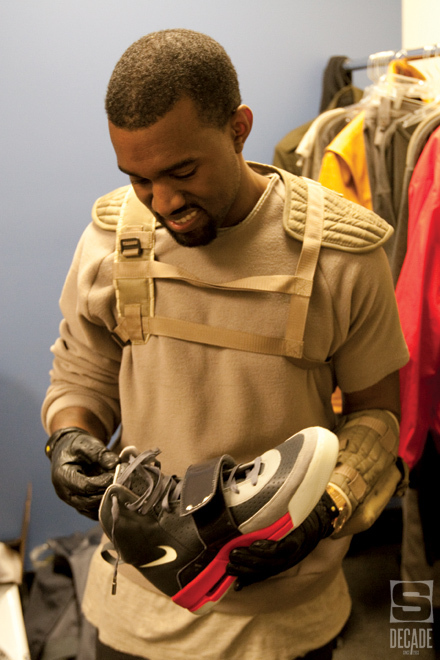 West brought in some of his favorite shoes at the time, and they also thumbed through details of past Air Jordans that Kanye liked, like the toe cap of the III, tongue height of the VI, molding of the V and silhouette of the II. The checklist read perhaps in disunion at first. Exaggerated collar. Organically flowing midsole. Versatile midfoot strap. And comfort – comfort was always a must. The design cues and elements of the shoe were aplenty, and yet the shoe still had a subtlety and cleanliness that made it appear futuristic relative to the era Kanye was after – the ’80s – and not a bizarre and unconventional mess according to today’s standards. Due to the insistence on the shoe looking retro, feeling luxe and offering extreme comfort, early on the look of the shoe remained more subtle, while the bulk of the initial work would go towards the attention-getting elements, like the out-of-control tongue size, shape and height. “I just kept saying, ‘Well, if it’s truly a retro-ish product, it should be very simple.’ Things weren’t very complicated back in the day,” begins Smith. “The McFly had, I think, three pieces. There was the upper, outsole and then some interesting stuff going on in the midsole. [The goal was] the more that I could simplify it, and yet keep it a modern retro, so you couldn’t tell really from a distance if it was new or old until you got an up-close look at the details. 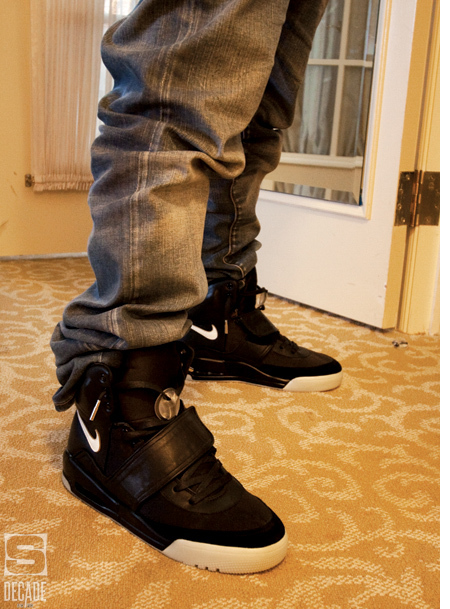 By the time 2008 rolled around, there was already a considerable amount of buzz building up on messageboards across the interwebs about a possible Kanye and Nike co-designed sneaker, and the digital savages couldn’t wait to check up on every last rumor, detail, camera phone picture or leak. For Mark Smith and the team, the internal process was a bit out of the usual only in terms of protecting information, as West is clearly a man whose every move is watched by paparazzi. They clamped down on every single sample made to try and prevent potential leaks. “We didn’t send anything out to him, ever. We would always just meet up. He would come out to campus or we would fly out to see him on trips. We always just kept it real simple and never left anything with him. We just showed stuff, and it frustrated him because he was thinking that we were just doing these shoes for him, and that we were going to give him stuff, but it was more about making sure it was on the right track because we just didn’t want it out there yet,” says Smith. “We didn’t want him walking around out there and wearing it and getting people to see it until we decided when was the right time. The Grammys felt like the right time to do something, and we were far enough along on the design that we felt like it was going to evolve, but not change. 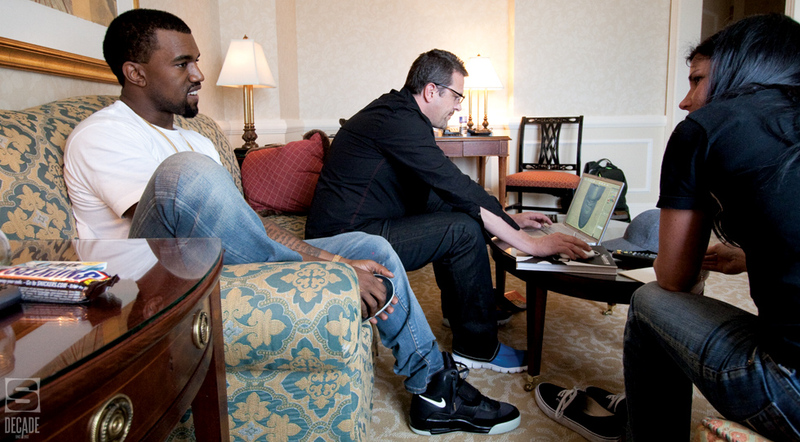 When it was all said and done, the Nike Air Yeezy likely took longer than everyone involved with the project expected – over a full two years – but its impact on the sneaker scene of 2009 is certainly undeniable. Supple leathers, loud liners and that intensely vibrant glow sole left people content with paying $215 at the door (at the few retailers that didn’t mark them up, at least), and on the online secondary market, prices peaked much, much more. What began as a simple design challenge for Mark Smith with a phone call from a longtime cross-campus friend had turned out to be that year’s most monumental sneaker release.